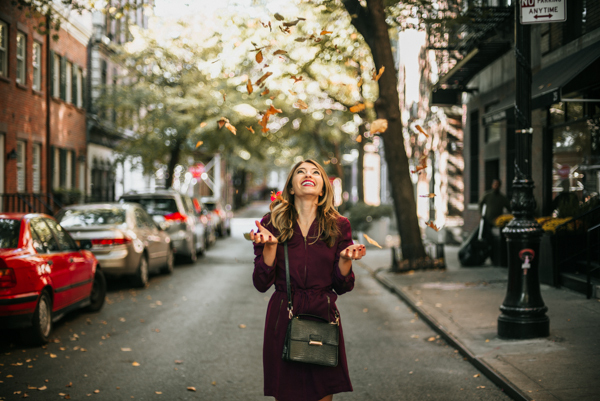 Brownstone-lined streets, chic corner cafes, hidden gardens, and a mix of culinary temples perfectly describes my favorite neighborhood in Manhattan, the West Village. Maybe it's because I started my career down the street off Houston and spent so many of my growing young adult years here, or maybe it's because it's quiet, tucked away, and feels straight out of a movie set. If you visit the West Village often then it's possible that you will find yourself walking onto sets. Not too long ago I literally bumped into Deborah Messing while she was filming The Mysteries of Laura. For the record, she is strikingly gorgeous. It was pouring rain at the time I saw her and not a hair was out of place. She just radiates beauty. 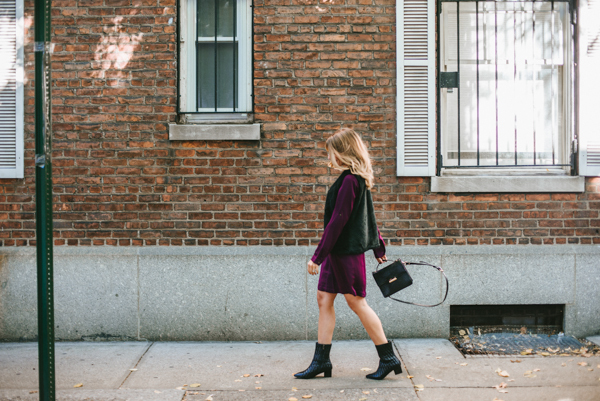 This is my favorite time of year to explore the village because of all the festive doorsteps. I always make sure to layer my outfit for the occasion. Thankfully, the weather has been mild lately so no need for bulky coats. 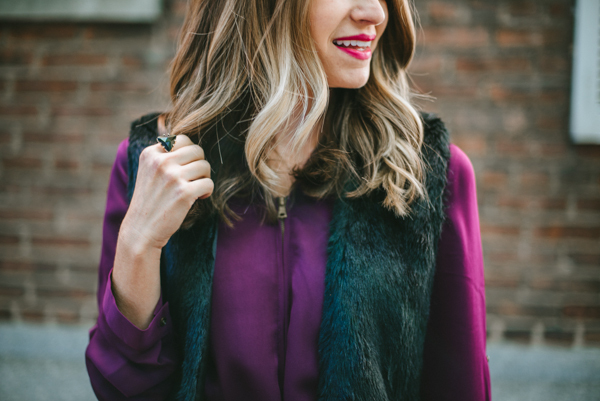 An oversized faux fur vest paired with a long-sleeved dress and ankle booties does the trick. 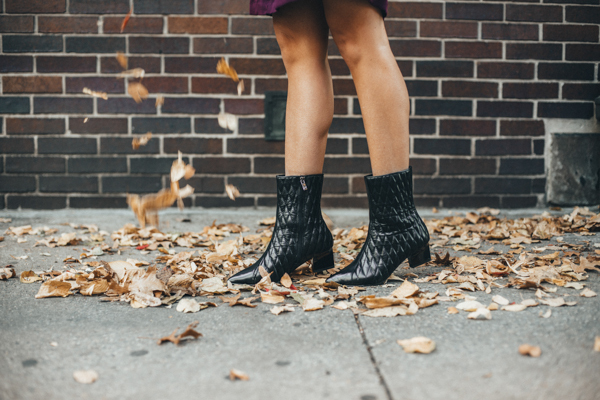 How stunning are these quilted leather booties from Adrianna Papell? The sharply pointed toe adds sophistication to the bootie and I also adore the subtle heel. I felt this zip front shirtdress complemented the booties really well. 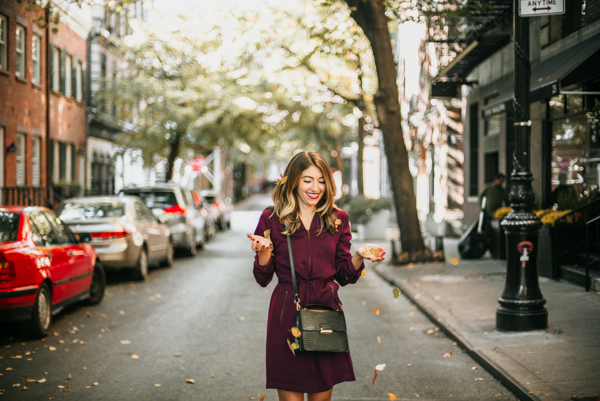 The rich purple hue is perfect for fall and I love the contemporary, yet chic zipper front and drawstring waistline. 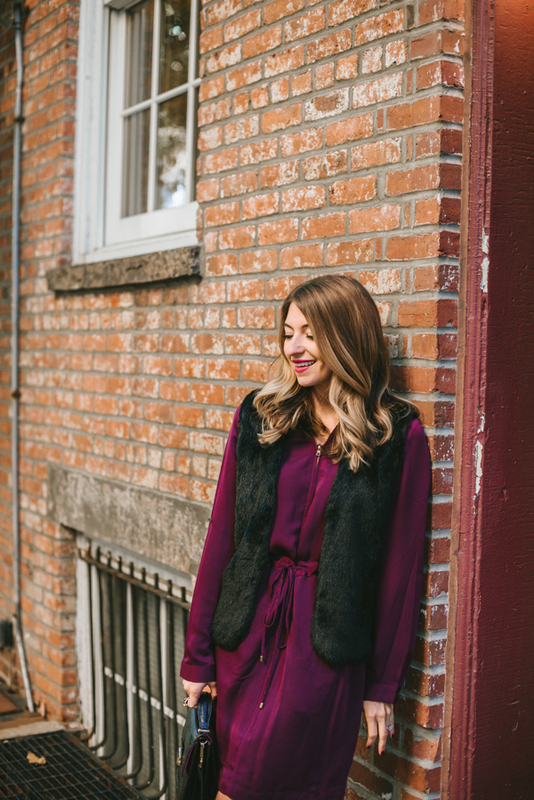 The 3 C's are always top of mind when I'm grabbing pieces from my closet and dressing for fall: cozy, cool, and chic...I may put a little extra emphasis on the cozy ;). Hope this outfit inspires you to get outside and take a long stroll before the harsh temps roll in. Have a great week! I can see why this is your favorite place! It's so beautiful! And I'm totally obsessing over you boots! I LOVE the quilted booties! So chic. Your pictures are making me really miss New York. I love your look, the photos are just so clear and lovely! Beautiful dress too :) Great post!